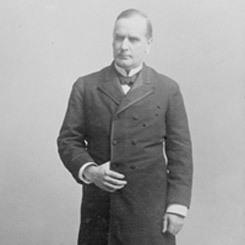 Image courtesy of Library of Congress William McKinley, Jr., of Ohio served seven non-consecutive terms in the House before becoming governor of Ohio and eventually President of the United States. On this date, the McKinley Tariff of 1890 became law—boosting protective tariff rates of nearly 50 percent on average for many American products. Ways and Means Committee Chairman William McKinley of Ohio led the effort in the House. The new legislation increased rates for many manufactured goods, while it placed items such as sugar and coffee on the free list. When Richard W. Townshend of Illinois, a stalwart Democratic opponent, delivered his customary protest against the measure on the House Floor, Republicans jeered him. Speaker Thomas Brackett Reed of Maine dryly explained, “It is not the speech we complain of so much as the monotony of the thing; we want a change.” The House passed the bill 164 to 142 and it slowly worked its way through the Senate. President Benjamin Harrison convinced Senate allies to insert a provision permitting the President to raise duties to match foreign rate hikes and to sign agreements to open foreign markets without congressional approval. McKinley unsuccessfully opposed the reciprocity provision on the grounds that it yielded closely-held congressional powers. Many voters, perceiving the McKinley Tariff as a boon to wealthy industrialists, registered their displeasure at the polls that fall. House Republicans lost 93 seats and Democrats swung comfortably into a commanding majority.